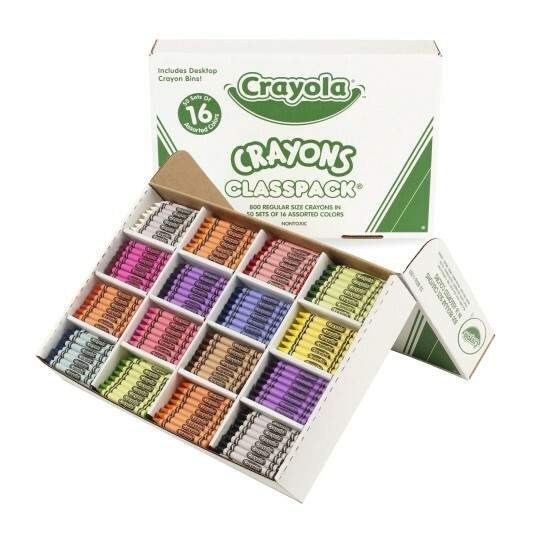 800 quality crayons from Crayola! Packed with value and creative possibilities! The classic kids' art and writing tool. 50 each of 16 colors, in separate bins. A rainbow of colors at an extremely tempting price. Regular-size, round, non-toxic Crayola® crayons. Fifty each of 16 colors: black, blue, brown, green, orange, red, violet, yellow, white, red orange, red violet, yellow green, blue green, yellow orange, blue violet and carnation pink. Box of 800 crayons. I am a retired First Grade teacher. It has been a joy to provide these crayons to schools in the U.S. Paraguay and Peru. Crayola quality is always exceptional. Our kids are loving the new crayons. They spend a lot of time in the art room and love getting new things.